Who & Why: This conference is very different this year, as the entire Radiology Department is invited. This means receptionists, transporters, Rad Techs, mammo techs, ultrasound techs, nuclear medicine techs, radiation therapy techs, CT techs, MRI techs, CVT techs, Rad Nurses, and anyone else in your departments that deal with patients. The main theme is interdisciplinary health care of our patients with a variety of demeanors, which is getting more interesting as time goes on. · Native Americans-MDH Director of American Indian Health/Tribal Liaison. 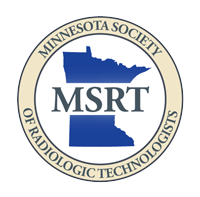 Registration will open in May, go on line www.mnsrt.com to register online or download to mail in form.